Heat oven to 375ºF. Place pie crust in 9-inch glass pie pan as directed on box for One-Crust Filled Pie. In large bowl, gently mix apples and cranberries. In small bowl, mix remaining filling ingredients. Add dry ingredients to fruit; toss to coat. Pour into crust-lined pan. In small bowl, mix all topping ingredients except butter and pecans. With pastry blender or fork, cut in butter until crumbly. Stir in pecans. Sprinkle evenly over filling. Cover edge of crust with 2 to 3 inch strip of foil to prevent excess browning; remove foil last 15 minutes of baking. 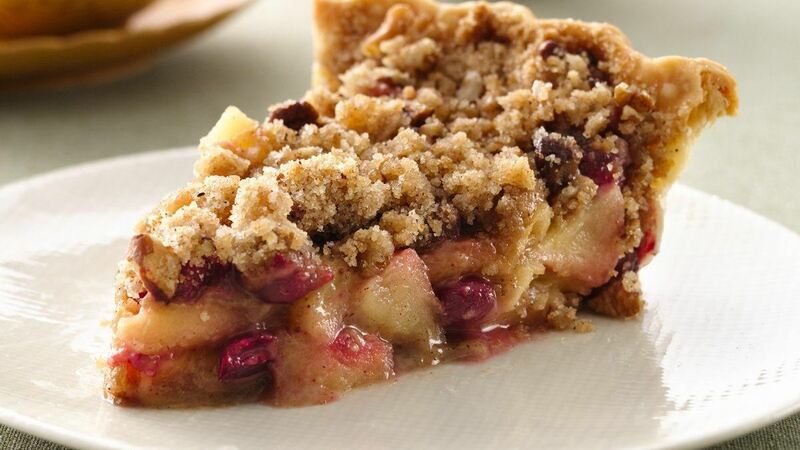 Bake 45 to 55 minutes or until apples are tender, and crust and topping are golden brown. If desired, serve warm with whipped cream or ice cream.